If the kitchen is a favorite room in your house, think about turning it into a whimsical and inviting place for friends or family to relax and talk over a cup of coffee. Think about kitchen decorating themes. I've been reinventing my kitchen. Right now it leans toward the shabby chic country theme, but I've thought for sometime about creating a coffee themed kitchen. I can pull it off by incorporating it into the shabby chic country theme I've got going. Every kitchen must have kitchen wall art. Start with a coffee theme clock. How do you like the coffee pot in the top left hand corner? I love it. At first, I thought it was a little pricey, but when I learned that the coffee cup and saucer at the bottom is a swinging pendulum, I decided I could splurge. It's made out of resin and hand painted. I'll have it forever so why not. Amazon has other coffee clocks that are more affordable, but not as cute. Now that decorative wall decals are on the market, you no longer need to be an artist to put lettering on your walls. It's fun to place a few whimsical and humorous quotes around the house--especially in the kitchen. 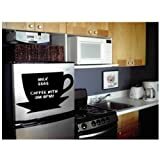 My favorite removable decal quote on Amazon is "Life's Too Short To Drink Cheap Coffee." That's my motto for sure. I hate cheap coffee. You can also get a large, coffee-cup chalk-board cup decal for the refrigerator or any appliance. It comes with non-toxic chalk for writing reminders or messages for your family. The adhesive backing is easily removable, so you can move it around the kitchen. 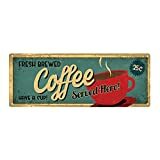 Another chalk-board coffee decal has a large coffee cup and smaller decals and a quote, or maybe you would like a dog and cat serving coffee set of decals. If you have a sense of humor, there are plenty of retro tin signs on Amazon and Ebay for your kitchen. A few of my favorites on Amazon are "Coffee, if you're not shaking, you need another cup" and "Wake the Hell Up! Rooster Brand Coffee", or "Drink Coffee, Do Stupid Things Faster with More Energy." If you're not into humor, or just don't see that as humor, there are plenty of signs with bland sayings. Oh my, I love all those clocks! Thank you, writer/artist. I love that clock too. Wow - these are some awesome ideas with coffee decor. Love the clock and the coffee cups. Yes, I love funny signs. Thanks for the comment. I love the clock, too. And those kitchen signs are a hoot! I had to click through to see the "Drink Coffee, Do Stupid Things Faster with More Energy" sign. You made me laugh! Thank you. That's my favorite. Great kitchen decors! 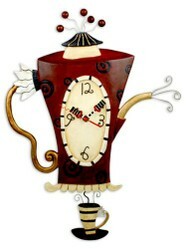 The tea & coffee pot wall clock seems great! Thank you, fitzcharming. I'm ordering one today. Those coffeepot clocks are precious. Makes me want a cup. Great selection. Hold on to your Beehive! 1950's Kitchens are HOT HOT HOT and here are some very COOL ideas to get your kitchen sizzlin'! Skull home decor isn't just for Halloween. Add a playful and macabre touch to your table with these skull salt and pepper shakers.